Ideas for personalized Baby Shower Mini Mason Jars . Can there be anything cuter than baby shower favors in baby food jars? 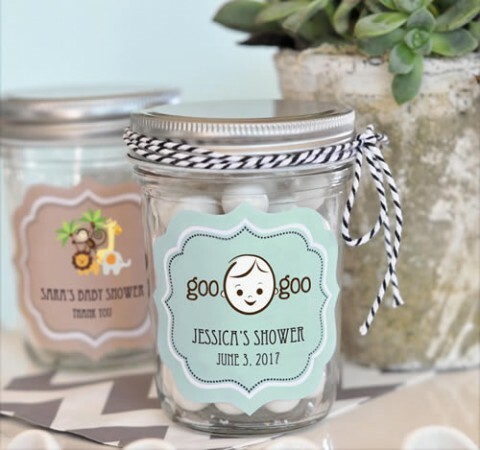 How cute would it be to celebrate your new little bundle of joy with Baby Shower Mini Mason Jars? These adorable jars make perfect edible party favors that you can fill with your favorite spices, loose-leaf tea, chocolates, candy, or nuts. Your guests can then refill them with their much loved treats as many times as their hearts' desire and remember this special day with every yummy bite! Jars arrive separate from the labels. Some assembly required (attaching the self-stick labels to the jars). Note: Mini Mason Jars can hold approximately 8 liquid ounces or about 115 jelly beans.